I love having the ability to die-cut my own gift tag dies for presents I give, but I also love being able to use them on my cards! 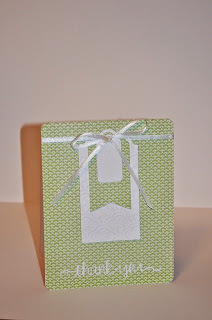 The Avery Elle Gift Tag Die set makes doing so very easy, and I love the sizes of the dies included in the set. There is a small, medium, and large tag. In these thank you cards, I will show you how I use gift tags on my cards and how fun they are to stack. Both cards feature patterned paper from the 6"x6" Fashionably Chic paper pad from Recollections. The tags were tied to the card using Offray ribbon. This card features a thank you stamp from Simon Says Stamp and a flower stamp from Hero Arts. I embossed both with Ranger's Liquid Platinum embossing powder. I adhered the largest tag to the card base, but the other two are not. They swing freely and give the card some movement. I enjoyed having the ribbon bisect the card, as I typically tie it like I did in the second card. I love this patterned paper because I have an embossing folder with a matching pattern! I embossed the largest tag with the matching folder from We R Memory Keepers whimsy embossing folder set. 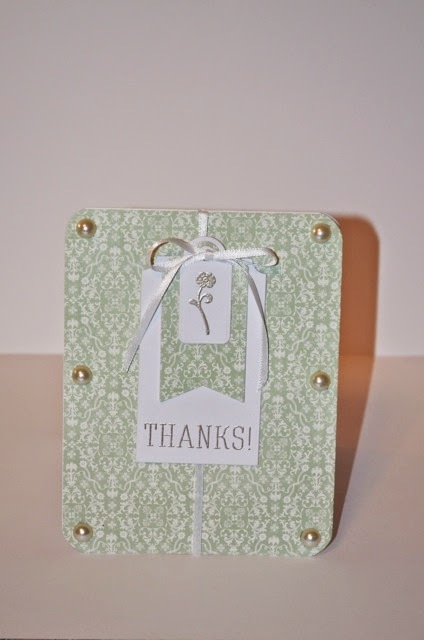 I used a thank you stamp from Avery Elle's Oh Happy Day stamp set and a flower stamp on the smallest tag. Both stamps were embossed with Ivory embossing powder from Recollections. Cardmaking From Scraps Challenge: What's on Your Desk? Should you make your own card bases?